Viking 3350 Series helmet sheds weight and adds viewing area with controlled darkening. The new Viking 3350 auto-darkening helmet from Lincoln Electric features top-quality LCD optics for a clear, natural view in varied ambient light settings, and give the welder a 3.34-inch height window in a standard cartridge shell. The Viking 3350 is a solar-powered unit supplemented with a replaceable long-life lithium battery, and features a toggle shade control for ranges from 6-9 or 10-13 darkening – to handle plasma cutting up through heavy plate welding. 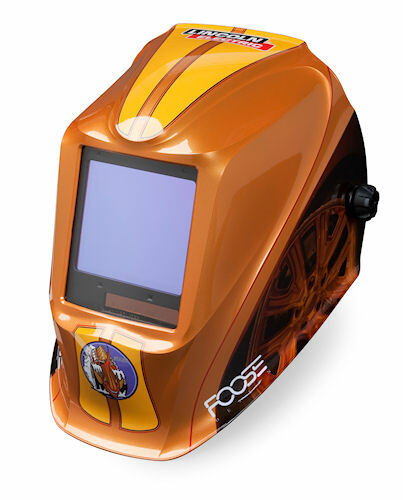 Internal controls allow the helmet to be pre-tested before welding. The 3350 is ideal for stick, TIG, pulsed TIG, MIG, pulsed MIG and flux-cored welding, as well as gouging and grinding. Lincoln's new Viking 3350 Series auto-darkening welding helmet is quick, bright and lightweight. A continuously-variable delay allows users to control how quickly the helmet returns from a darkened view back to the light state under a wide variety of lighting conditions. Four independent arc sensors work together to avoid blind spots which could prevent auto-darkening and eye damage. An additional advantage of the quick-acting, broad-range helmet is its light weight – 21 oz. All Viking helmets are hard-hat adaptable and capable of housing magnifying "cheater" lenses. They come in black and four additional styles, the Patriot, Tribal, Motorhead, and the Chip Foose-designed Terracuda (shown). For more information on the new helmets, visit www.lincolnelectric.com.